The UK new car market fell 20.5% in September to 338,834 units as the move to the new WLTP testing regime brought anticipated falls for private, fleet and business registrations. Fleet was the hardest-hit of all three segments – down 22.4% to 155,417 units from 200,297 in September 2017. Private registrations were next with a 20.1% decline to 162,972 units from 204,045 a year ago. Sub-25 ‘business’ registrations saw the smallest decline with a 6.3% fall to 20,455 units from 21,828. It follows an exceptionally high August as fleet and retail buyers took advantage of bumper discounts and lower tax implications for non-WLTP-tested models – fleet registrations rose 19.7% last month in what’s normally the quietest period of the year on the back of a 2.6% rise in July. As a result, the industry had been bracing itself for a decline in September – normally the biggest month by far for new car registrations – compounded by supply issues as manufacturers raced to beat the 1 September deadline for the new emissions testing. This has led to some models being withdrawn, either temporarily or permanently. September’s decline also hit on the year-to-date figures. August’s unseasonable rise in registrations across the board – also seen in Europe – had brought an improvement in figures for the first eight months of the year with the overall new car market just down 4.4% on 2017 and 4.7% for fleets. However, September’s decline means the market for the first nine months of the year is down 7.5% and 8.0% in fleet. 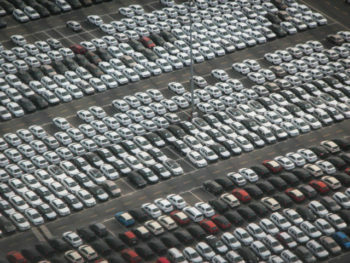 Announcing the figures, the Society of Motor Manufacturers and Traders (SMMT) said the testing backlogs had affected deliveries across the board but said that over the coming months, some rebalancing is expected as an increasing range of new models are certified for sale and backlogs ease. However, there have also been reports of fleets holding off on new car purchases due to tax uncertainty as HMRC looks to switch to new formats of VED and Company Car Tax for WLTP-tested cars from April 2020. Although there has been much industry conjecture about whether this is part of an ongoing trend, the exceptional circumstances – added to by the diesel downturn and Brexit uncertainty and even last year’s VED changes – mean it’s too early to draw any conclusions for the new car market. But Lex has highlighted that the Government can help drive the market by providing much-needed fleet taxation clarity in the October Budget. The September downturn could also well bring an uplift for the used car market, as discussed by a number of industry experts. September registrations also brought some positive news for hybrids and plug-in electrics; these were up 3.9%. But diesel was down 42.5% and even petrol fell 6.7% – again, the extraordinary context makes it hard to draw any conclusions here. Declines were also seen across almost every vehicle segment, with MPVs and Specialist Sports cars showing the biggest falls, down 54.8 and 50.9%. Luxury saloons were the only segment to register growth, up 3.5%, while Crossover cars, which have enjoyed strong growth over the year to date, held steadier than most, falling just 3.5% in the month. Looking ahead, Mike Hawes, SMMT chief executive, said the market was “keen to recover lost momentum” and also said the industry welcomed the tough new WLTP certification and the supplementary Real Driving Emissions (RDE) test.